The white-tailed deer is common across much of southern Canada. It's a symbol of the elusive yet constant presence of nature in this land. 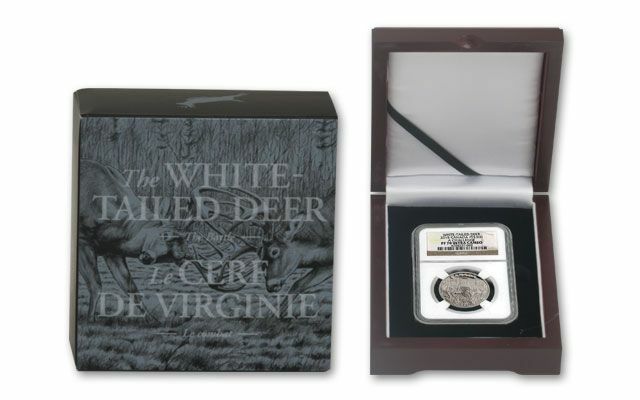 Now, the white-tailed deer is available for viewing year round - thanks to this exquisite coin. 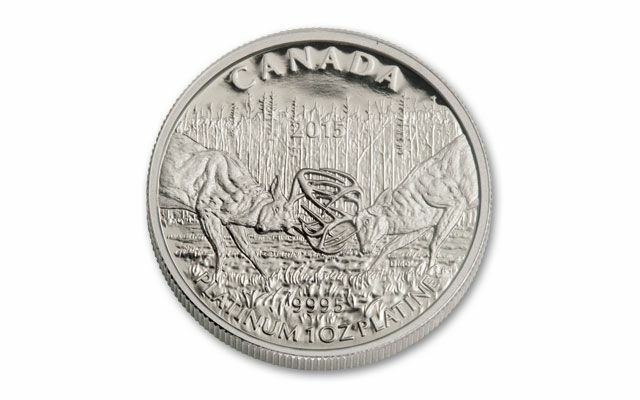 This 2015 Canada $300 White-Tailed Deer One-Ounce 99.95% Pure Platinum Proof coin features expert engraving and the use of multiple finishes to bring out the stunning details in this image of two bucks squaring off in the late-November mating season. 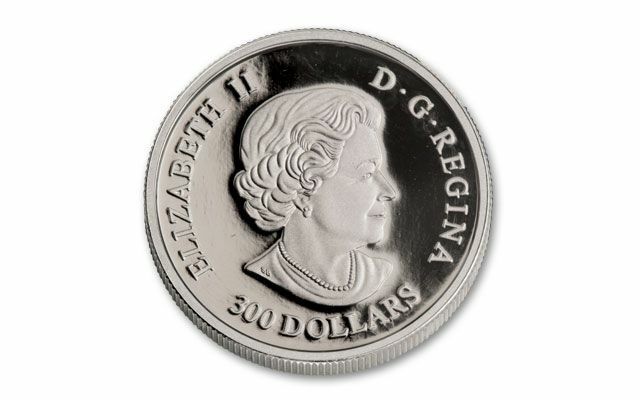 An exceptionally low mintage of only 200 coins, means that this premium edition will be popular. 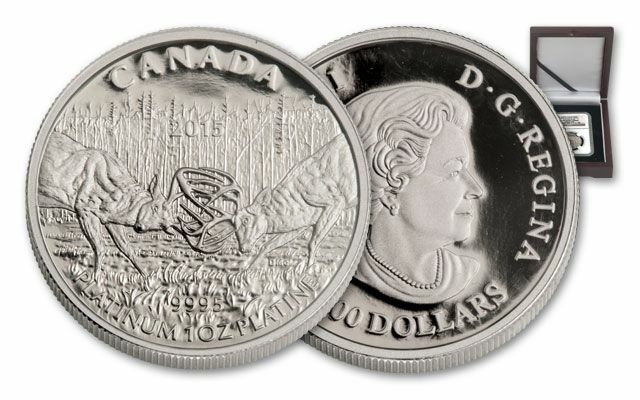 Here's your chance Celebrate the life and habits of a beloved Canadian species, struck in 99.95% pure platinum in an engraved work of stunning artistry. 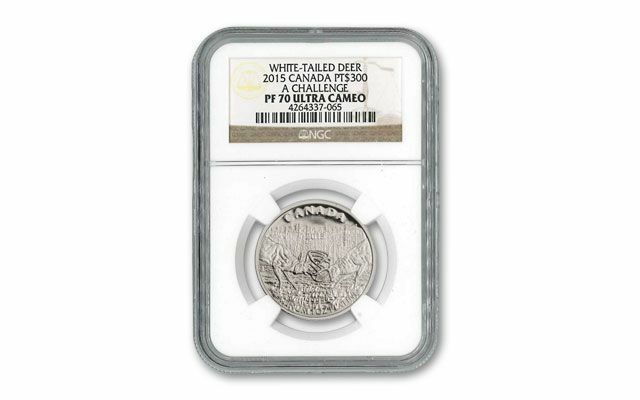 Designed by Canadian artist Desmond McCaffrey, your coin features an image of two mature male white-tailed deer squaring off during the autumn rut. Designed to showcase the grace and power of two fighting bucks at the height of their strength, this image renders in fine detail two males locking their large multi-tined antler racks. With pleasing visual symmetry, the males face each other from the left and right sides of the image. They have just run at each other and now balance on their front legs in a powerful push for superiority. Their blunt-nosed muzzles are turned toward the viewer. Their variations of shading and rippling neck and back muscles are rendered in dimensional detail using advanced engraving techniques. The bucks fight in a large open field of sparse, dying grasses in late fall. Behind them is the dense and leafless autumnal boreal forest. This example grades perfect Proof-70 (PF70) by Numismatic Guaranty Corporation (NGC). Secure it for your collection today!